Colombia is adopting a new approach to urban development that focuses on densely populated areas. The concept is supported by KfW. 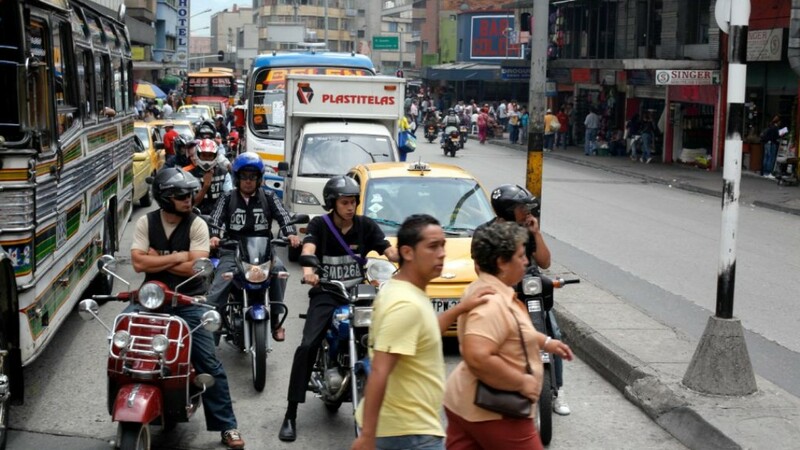 Proportionally, more people live in cities in Latin America than anywhere else in the world. Between 80 and 90 per cent of its population lives in urban centres. Megacities like Mexico City or Rio de Janeiro are facing challenges associated with the growing pace of urbanisation, and officials in many smaller cities also face similar issues, even if to a lesser extent: insufficient living space, too much traffic, long distances, long transport times, poor air quality. To address these problems, Colombia has opted for a new course instead of merely allowing cities to continue to grow unabated and build new districts and roads. For quite some time, it has been evident that urban growth has overtaxed humans and nature and is neither sustainable nor liveable in the long run. In some model cities, Colombia is therefore pursuing what is known as the "transit-oriented development" strategy, TOD, which promotes compact and mixed-use urban districts by clustering jobs, housing and leisure activities. One important goal of TOD is to ensure public transport is accessible by foot and more space for sustainable transport, green spaces and parks in general. It is expected to improve the quality of life for residents, shorten distances and commutes, but also reduce greenhouse gas emissions in the age of climate change. "TOD combines land use with traffic planning and integrates everything into an overall concept that also includes the private sector," said Steve Winkelman of the Center for Clean Air Policy (CCAP) recently at the presentation of the concept at KfW. After all, "mobility is not an end in itself," said Winkelman, but "a way to create access". The programme is initially being implemented in four cities by Findeter, the Colombian development bank, in cooperation with CCAP, an international think tank. Findeter is receiving support from KfW Development Bank in the form of grants totalling EUR 11.7 million from the NAMA Facility.— the facility was founded in 2013 by the German Federal Ministry of the Environment, Nature Conservation and Nuclear Safety (BMU) and the British Department of Energy and Climate Change (DECC) to enable ambitious developing countries and emerging economies to implement their national climate change mitigation plans ("Nationally Appropriate Mitigation Action" / NAMA). Findeter is using the grants to create a credit line for the Colombian model cities that want to pursue urban development consistent with TOD. All financing comprises a loan and a grant component. However, Findeter is much more than a financier: the bank also acts as an advisor and lawyer for sustainable urban planning. They will train the urban management authorities to integrate TOD into their urban planning activities over the long run. The model districts are being created in the four medium-sized cities of Montería, Manizales, Cali and Pasto in cooperation with the local administrations and the involvement of the private sector. The plans are currently being created, the first changes will be undertaken in 2019 — usually the initial focus is on strengthening non-motorised transportation with cycle paths and pedestrian zones. But the plans also span comprehensive public transport systems and new jobs. Juan Manuel Robledo, responsible for the programme at Findeter, hopes that the districts will serve as good examples for the whole country in many respects: in the cities themselves that see that integrated urban planning pays off — also economically — and decide to pursue TOD. But also in national policy which creates legal incentives for TOD, not least of all due to Findeter's commitment. We know from other cities and countries, including Brazil, that TOD can reduce the volume of traffic by 20 to 40 per cent by encouraging the use of non-motorised and public means of transport, stimulating business along bus routes, attracting more tourists to cities, reducing accidents and lowering healthcare costs. "TOD has a lot of co-benefits — which is what we want to demonstrate," said Robledo. According to the project manager responsible, Katharina Heß, the concept also has potential for other regions but has to be adapted to local conditions and culture. "There's not a blueprint, but it is clear that cities around the world have to find ways to deal with urbanisation and increasing traffic volumes. TOD is an urban planning tool that meets these needs."